Structured Settlement Loan, Or Buyout? You may have been surprised when looking for a structured settlement loan and ending up bumping into ads or sites pitching you to cash out your structured settlement. Or may be you yourself are not clear in the difference between the two? Well, to be clear, a structured settlement transfer, or cash out, is NOT a loan. A loan is a loan. Period. Read this: Is it possible to get structured settlement loans? 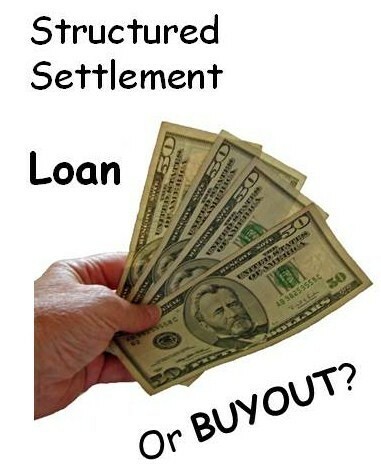 Here's the difference in brief between a structured settlement buyout vs a loan. A BUY-OUT, or CASH OUT, means that the company, the buyer, will pay you - the structured settlement holder - a lump sum in exchange for selling your future payments to them. What you get: a certain amount in ready cash. What the structured settlement buyer gets: the rights to receive the future payments. In essence, you are giving up your structured settlement payments in favor of a lump sum now. A LOAN is a different story. In a loan, what you get is just that: a loan. A loan has to be repaid. You bear the liability to pay back the loan to the lender, while the structured settlement payments serve as a collateral. In this case, the structured settlement payments are still yours. They have not been transferred to others, but even though the payment rights are yours, you can't use them. The lender now has the right to receive your payments as a pay-back for the loan. Structured settlement loans, like transfers, have their pros and cons. But what you need to remember is that with a loan you are taking upon yourself a responsibility, a debt to pay back. Structured settlements may be considered a safe product, but regardless of how secure it is, it always remains your sole responsibility to pay it back no matter what every happens to the structured settlement. On the other hand, a structured settlement transfer means that you are selling your structured settlement and give up your ownership on the payment-rights. You will not receive the payments any more but instead are paid a lump sum now. The money is yours to use. It's not a loan, it's not a debt. You don't owe anything to anybody. You WILL get far less in your lump sum compared to the future value of your payments. This is the trade off of selling your structured settlement. It comes with a price. Be Clear: A Loan, Or A Sale? You may still be looking for a loan. If this is the case, don't let yourself get confused by ads and sites promoting cash outs while pretending to respond to your quest for a structured settlement loan. Just do a simple search on the Internet, see what comes up. You'll know what I mean. It's simply not the same thing. Let's be clear: are you in need of a loan, or looking to sell your structured settlement for a lump sum? If the latter, I'm here to assist you. Give me a call to get a free quote and a great deal. I will never deceive you. If you need a loan, I will tell you in simple terms: I do not give loans. Call now to cash out your structured settlement for a lump sum. More: Is it possible to get structured settlement loans?